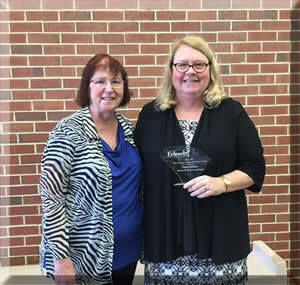 FOSCL President Elaine Kjellquist (right) presents the 2018 Outstanding Individual Award to Sharon Purvis with the Friends of the Harvin Clarendon County Library. Proud Library Director Charlotte Johnston (left) looks on. Congratulations to Paula Childers who received the John Landrum Advocacy Award at the 2017 FOSCL Annual Meeting. She was nominated by Friends of the Florence County Libraries. 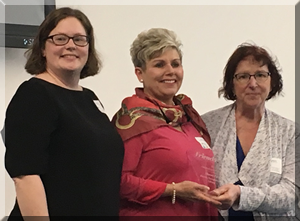 Congratulations to Harlie H. O’Connell who received the Outstanding Public Library Employee Award at the 2017 FOSCL Annual Meeting. She was nominated by the Friends of Newberry County Libraries. Public Service Award: The FOSCL Public Service Award was created in 1996 to honor an elected official for his/her support of a library (libraries) in South Carolina. FOSCL award program was reorganized in 2007 and this award was closed. 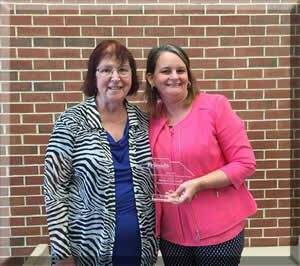 Library Staff Award: The FOSCL Library Staff Award was created in 1996 to recognize a library employee who has contributed above their normal duties to support a library or libraries in South Carolina. Business Award: The FOSCL Business Award was created in 1996 to honor a business in any community in South Carolina that has significantly aided a local library and its local Friends group. Trustee Award: The FOSCL Trustee Award was created in 1997 to be presented to a public library trustee in South Carolina who has significantly contributed to a local library. Outstanding Program Award: The FOSCL Outstanding Program Award was created in 1999 to recognize a Friends group, which has a successful program or event. FOSCL award program was reorganized in 1997 and this award was closed. John H. Landrum Advocacy Award: The FOSCL John H. Landrum Advocacy Award was created in 1999 to honor an individual or group, which has excelled in library advocacy. Special Awards: Outstanding support provided to FOSCL and libraries in a manner different from that described by the other awards. Recognizes outstanding South Carolina elected officials who have been honored by a local Friends' board. Local Friends' Boards may nominate for consideration by FOSCL those individuals whose advocacy, support, and encouragement have been critical to the success of their own local library services.